Nagarkot, located 32 kilometers east of Kathmandu, is one of the most scenic spots in Bhaktapur district and is renowned for its spectacular sunrise view of the Himalaya when the weather is clear. Visitors often travel to Nagarkot from Kathmandu to spend the night so that they can be there for the breathtaking sunrise. Nagarkot has become famous as one of the best spots to view Mount Everest as well as other snow-topped peaks of the Himalayan range of eastern Nepal. Nagarkot also offers an excellent view of the Indrawati river valley to the east. With an elevation of 2,195 meters, Nagarkot also offers a panoramic view of the Valley and is described by visitors as a place whose beauty endures year round. Meet us at the airport, transfer to Hotel. Overnight at Hotel. 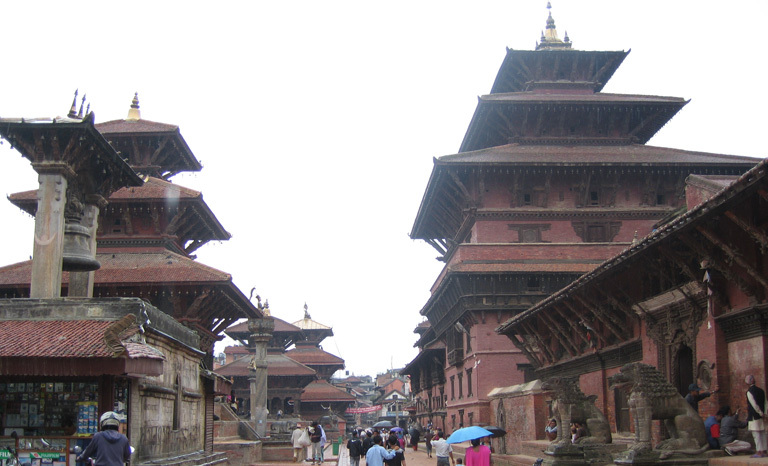 Visit Kathmandu Durbar Square, Swyambhunath (Monkey Temple) and Patan Durbar Square. Overnight at Hotel. Visit t Pashupatinath Temple, Boudhanath and Bhaktapur Durbar Square. Afternoon, drive to Nagarkot. Overnight at Hotel. Early morning sunrise view over the Himalayas. After brekfast, Walk around Nagarkot. Visit Chang Narayan. Back to Kathmandu. Overnight at Hotel. Free till departure, transfer to airport, fly back to Home. Meet us at the airport, transfer to Hotel. Rest. Visit Kathmandu Durbar Square, the place of the Malla and then the Shah Kings of Nepal, visiting Kumari Temple, house of the virgin goddess, visiting Swoyambhunath, a stupa on the top of hill - from here you can overlook the scenery of Kathmandu, Visiting Patan Durbar Square, the second largest town in the valley, Krishna Mandir, Golden Temple etc. Visit Pashupatinath Temple, one of the most important Hindu temple in Nepal. We keep going for walk to see the huge of stupa of Buddha, also known as Bodhanath, the largest stupa in Nepal. Afterward taking a ride to Bhaktapur, a fascinating town, visit Bhaktapur's Dubar Square featuring the Victorian illustrations style with temples and temples complex. Keep the route connecting to Nagarkot. Early morning sunrise view over the Himalayas. After brekfast, Walk around Nagarkot. Back to Kathmandu, free for personal activities. Please contact us for your own tour date as we offer tour on any dates that is suitable for you. And also please note that this is tailor-made tour, you can add or reduce the days & places in tour program as per your time availability. We're sad that this is our last day in Nepal. We are sitting in Dwarika's lovely and relaxing library, waiting for dinner and our flight to China. We would like to begin by thanking you so much for assigning Baburam as our guide. His knowledge, patience, flexibility, and love of the Nepalese culture enriched our experience more than we could have imagined. Everyone has been helpful, friendly, accommodating and all have contributed to our wonderful short visit to this beautiful country. With Narayan at the wheel, we felt perfectly safe. We both look forward to a return visit to Nepal. Dear Roka, Thank you so much for setting up such a wonderful trip to Nepal for us. We loved it and everything went very smoothly. Our guide was excellent, very knowledgeable, and so nice. Nagarkot was a highlight. The evening we were there we were out on the deck having tea and we looked out, the clouds parted, and there right before us were the incredible majestic Himalayas in all their shining glory. It was stunning. Again thank you for lining up such a memorable time in Nepal. The flight over Everest was spectacular and something I will never forget. We would definitely recommend your services to anyone wanting a well organized trip to Nepal. We've been home for about a week now, and I just wanted to write and tell you what a great time we had in Nepal. Our guide, Dinesh, spoke English well, and was very fun and knowledgeable about everything. He explained things to us in detail, and led us to some wonderful experiences. The Hyatt is a great hotel; we were comfortable and the food and service were good. Our driver knew his way around well, and was always courteous and on time. You made sure we knew in advance about all the little details, like the mountain flight passenger tax, the Nepal departure tax, and the ticket stamping. We didn't know about any of these before. Our trip was perfect...absolutely nothing went wrong! I would be happy to recommend Friendship Nepal and Dinesh to anyone! Thank you!! I have been to over 15 different countries, and let me tell you Nepal with Friendship Tours and Travels blew everything out of the water. This company is professional, reliable, and the service is excellent. Roka responded to my emails promptly and was very accommodating. He quickly and easily arranged a custom tour for me based on what I wanted to see. The driver, Bashu Poudel, was excellent. He is a very skilled driver. I really appreciate him taking me everywhere with safety as a priority. He is very kind, professional, and great company. I cannot emphasize enough how impressed I was with him and how thankful I am that I had the opportunity to meet him and that he was my driver. The Kathmandu guide, Ramesh Koirala (Sasha), was incredibly knowledgeable, friendly, kind, and honestly the best tour guide I have ever had. The tour guides in other sites were fantastic as well. Every hotel the company put me in was excellent, among the best I have ever stayed at with excellent service, staff, food, and cleanliness. Apsara Boutique Hotel in Kathmandu, Peaceful Cottage in Nagarkot, Buddha Maya Garden in Lumbini, and The Kantipur Hotel in Pokhara all were among the best hotels I have stayed at in the world. I highly recommend this company!!! Just returned from a 11 day private tour of Nepal, visiting Kathmandu, Nagarkot, Chitwan, Lumbini and Pokhara. The tour was very well organised, good communication and Roka was patiently waiting when we arrived at the airport despite us taking some 3 hours to get our visa. I honestly cant think of much, if anything I would change. Perhaps being picky the hotel in Lumbini was not great, but to be honest I dont think there was much out there that was any better and certainly wasnt the fault of Friendship tours. Would not hesitate to book again. We really had a great time in Nepal having selected the correct travel agent and also the people of Nepal who are so friendly and gentle and nice. And not forgetting the fanstastic scenery and also the mountains that was really awesome which I am sure we will not be able to see from our country. We look forward to having another trip to Nepal again in the near future. Once again, thanks for the great arrangement during our trip and till then, do keep in touch and take care. From the time I emailed them until we left they were always good about communicating. They tailored a trip to exactly what we wanted. They even contacted us after the trip to make sure that we were happy with how everything went. The only hiccup was we went specifically during Holi week because we wanted the full immersion of the culture and on Holi day everything was closed so we paid for a day but did not really get to do much. But our driver/guide was Buddhist instead of Hindu so he took us around for a few hours and then we were on our own the rest of that day. But otherwise Nepal was the most amazing experience ever and this tour company helped make it that way.